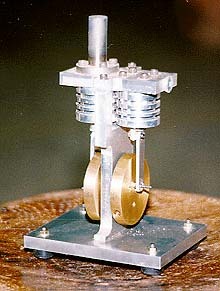 This engine is a two piston type Stirling engine with a cap type heater made of stainless steel and it does not have a regenerator. Its cooling system is a natural convection cooling by air. The pistons and cylinders use medical syringes made of glass, so the engine has few leakage of the working gas and small friction. To minimize the friction loss, at all of drive parts are used ball bearings. This engine has high speed performance. It can rotate about 4000 rpm. Now, I am preparing the figures of ESE-10.